Vegan Pointe shoes are available as special order and I can indeed send them worldwide. Are you located abroad? Then knowing your exact model, size, width and shank in a Grishko pointe shoe will be vital prior to ordering. Grishko special order pointe shoes can also have a variety of aspects of the shoe changed to suit your requirements. With vegan pointe shoes, the sole is changed from leather or suede to a cellulose material. All Grishko ballet slippers (soft shoes) can also be made vegan. Grishko pointe shoes are all made in Russia by hand to the highest of standards. There is a Grishko pointe shoe model to suit all types of feet and strength. 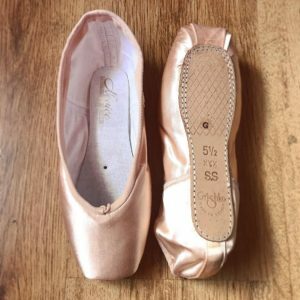 Based in Essex in England – I am a pointe shoe fitter who travels the country helping dancers achieve that perfect fit. Any questions? Feel free to contact me 🙂 by clicking here.